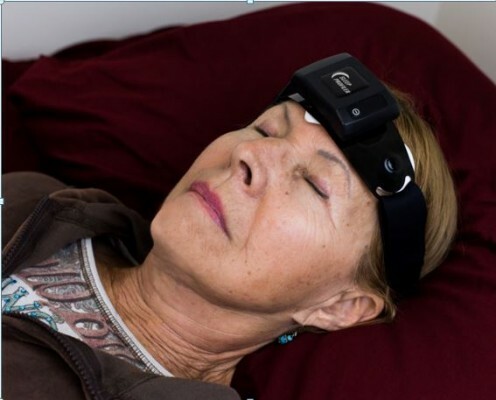 Objective: Submentalis electromyography (sEMG) and frontalis electromyography (fEMG) muscle activities have been used to assist in the staging of sleep and detection of disruptions in sleep. This study was designed to assess the concordance between sEMG and fEMG power, by and across sleep stages. Methods: Forty-three records with simultaneous acquisition of differential signals from the submental and frontalis muscles were evaluated. Sleep stages were assigned using the polysomnography signals based on majority agreement of five technicians. The sEMG and fEMG signals were identically filtered and aligned prior to cross-correlation analysis. Results: A strong concordance between sEMG and fEMG power was observed, with 95% of the records exhibiting at least moderate agreement. During rapid eye movement (REM) sleep, sEMG power was significantly less than fEMG power, but exhibited four times greater across-subject variability. fEMG power during wake and non-REM (NREM) sleep was greater than sEMG power, but with 50% less variability. Differences in wake and N1 mean power and between the other sleep stages were more distinct in the fEMG recordings. Relative changes in sEMG and fEMG power across wake, NREM, and REM stages were essentially ­identical with median by-subject cross correlations of 0.98 and interquartile ranges of 0.97 and 0.99, respectively. Conclusion: The fEMG and sEMG power values were similar during wakefulness and sleep; however, the frontalis exhibits substantially less between-subject variability. This study established face validity for the use of fEMG in the detection of wake and stages of sleep, and for future applications toward assessment of quantitative REM sleep muscle activity in REM sleep behavior disorder.